Compressed-air dryers fall under the category of dry air dryers. They use compressed air, expanded to atmospheric pressure, creating dry process air with a low dew point. This air is heated to the required temperature in the dryer. 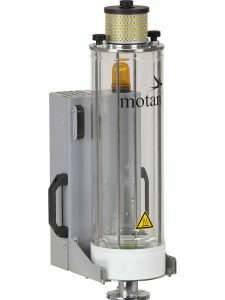 Compressed-air dryers do not require desiccants. The heated air passes through the material, taking on moisture, and is subsequently expelled with the entrained moisture. Compressed-air dryers themselves are comparatively affordable, but compressed air is expensive. As a result, these systems are generally only suitable for drying small quantities of granulate. Dry, oil- and water-free compressed air is a prerequisite for operation of these systems. The underlying principle of compressed-air dryers is that expanding compressed air causes the dew point to sink. These systems can achieve dew points of -20°C or lower, depending on the initial dew point of the compressed air. Air always contains water vapour. When air is compressed, the pressure increases and volume decreases, and the amount of water it can hold is reduced. This is comparable to a sponge – when expanded, it can hold a certain amount of water, but when compressed, the water is squeezed out. Compressing the air raises the temperature, which raises the pressure dew point. The pressure dew point is the temperature to which compressed air can be cooled without causing entrained moisture to condense. If the compressed air cools further in the compressor, the entrained moisture condenses, causing the air’s absolute humidity to sink. The pressure of this air is subsequently reduced prior to it being fed into the production facility’s internal compressed-air distribution system, causing the pressure dew point to fall. This pre-expanded air is then fed to the compressed-air dryer, where it is expanded further, then through a heater, and finally through the granulate.